Description: Cabinet card of an infant sitting on a blanket-covered prop. The baby is wearing a gown. Description: Cabinet Card of Maude Clark, age 22 months at time of photograph. Clark sits on a studio prop couch with one arm on the rest. She is wearing a white lace ruffled dress and her hair appears to be in sausage curls. Description: Cabinet Card of Maude Clark, age 22 months at time of photograph. Clark sits on a studio prop couch with one arm on the rest. She is wearing a white lace ruffled dress and her appears to be in sausage curls. Description, Reverse: Maude Clark was 22 months old when ? is now 5 years old. Description: Cabinet card of Peter Claus' bust, fireman. Claus' slicked, parted hair, and waxed handle bar moustache suggest the photo dates back to the 1880s. Claus is wearing a dark suit with a white button up shirt. A chain hangs from his vest, and there is a pin at the base of his tie. Description: Cabinet card of Carlton D. Grover's bust. Grover has a dark buttoned jacket on with a tie, and a pretty heavy beard. Description: Cabinet card of Leo S. Haskill's bust in a rectangular frame. Haskill is wearng a suit with a flower pinned to his lapel. Photo taken by J. L. Reed in Petaluma, Ca. Description: CDV of a woman resting on a fringe studio chair in an oval frame. Her hair is pulled up into a braided up do and she is wearing a plaid dress. Description: CDV of a young girl sitting on a blanket-covered studio prop. She is wearing a plaid dress with a white lacy bib. Description: Carte de visite of Jennie Otis McNear's bust. McNear sits at a studio prop table with her hands folded. Her hair is styled into a braided crown and the rest of her curls fall freely. She is wearing a light dress with a white ruffled collar and heavy necklaces. 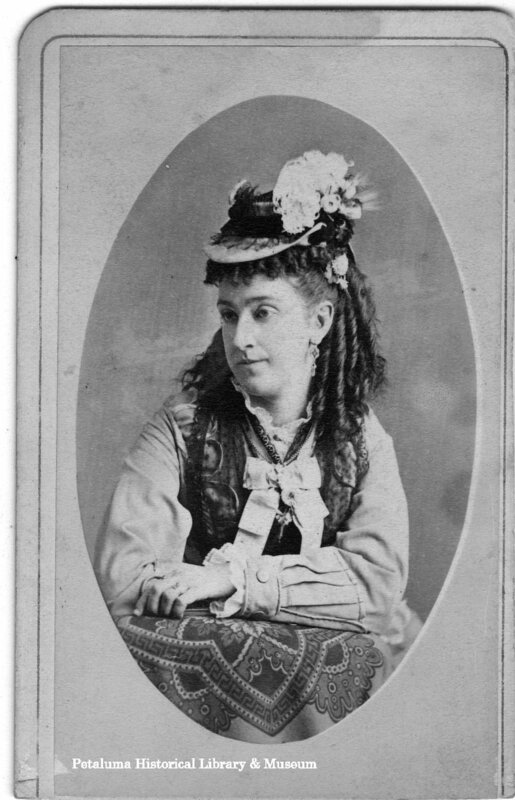 If you look closely you can see she is wearing a wedding ring, dating this photo between 1880 (her marriage to George McNear) and 1883 (the year of her death). Biographical Note: Jennie Otis was the first wife of George Plummer McNear. She was born 1857 and died 1883, the result of an explosion. Bibliography: Marin Journal, Volume 23, Number 12, 31 May 1883. Description, Reverse: Mr. McNear’s 1st Wife. J.Q. Reed, Photographic Artist. Over Wells, Fargo & Co’s Ex. Office, Main St., Petaluma, Cal. Description: Cabinet card of U. L. Prince. Prince's hair is parted on the side and combed. He is wearing a jacket, white shirt, and tie.